Auckland’s harbours are one it’s defining features and correspondingly the phrase “we should make better use of our harbour for transport” is a common refrain we hear in Auckland. Fullers want to deliver that and today have released a report titled Unifying the Hauraki Gulf that appears to have been developed alongside ATEED (Auckland’ Tourism, Events and Economic Development). Fullers360, the iconic Auckland ferry company, introduces Gulf 2025: a bold plan to encourage greater prioritisation of ferry planning. Gulf 2025 is outlined in Fullers360’s report Unifying the Hauraki Gulf and calls for commercial and public collaboration and investment across the Hauraki Gulf to meet Auckland’s exponential population and visitor growth. 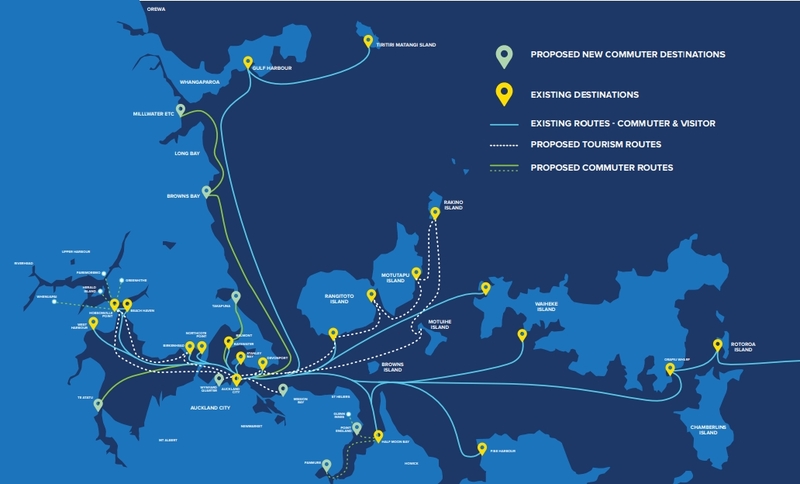 The report details the extensive benefits of ferry travel to Auckland as qualified by New Zealand Institute of Economic Research (NZIER): Ferries decrease road traffic congestion, reduce carbon emissions, increase productivity and contribute to the economy, boost tourism spending, and improve social and community connectivity and wellbeing. Before I delve into the report, a quick history on ferry usage. The annual number of trips taken on ferries in Auckland peaked during WW2 at about 10.6 million trips. Usage declined again in the post war years before plummeting following the opening of the Harbour Bridge in 1959. Like with trains, usage reached its lowest point in the early 90’s and fewer than 900k trips were taken at that time. Since then things have improved and new routes added, usage has grown and for the year to the end of October, 6.2 million trips were taken. While we have a number of ferry routes, most of those trips, 4.8 million (77%), took place on just two routes, Devonport and Waiheke. These are the two routes that are currently exempt from control by Auckland Transport and run on a fully commercial basis. Below is a quick graph showing how ridership has changed over the last decade or so. Auckland Transport are currently developing a new ferry strategy and so this seems to be either trying to compete with or to influence that. I understand Auckland Transport recently and unsuccessfully tried to tender out the non-commercial routes. With this report I wonder if there is a bit of game playing here. Given the above, it seems odd that one aspect of the council family, ATEED, appear to be deeply involved in lobbying AT. The report itself basically breaks down the benefits of ferries and puts values around them, both for commuters and tourists. The benefits are summarised on this page. Where I think the report falls short is that it is primarily staring off the stern and doesn’t give any indication of the future, instead just saying we’ll need more of everything. The benefits of ferry travel to Auckland are extensive: reduced congestion, lower emissions, increased tourism and a vibrant Gulf community. But this is just the start. Passenger numbers will grow from six million to nine million by 2025. That’s exciting – but this growth adds increased pressure and complexity. It will require more vessels, more routes, improved wharf infrastructure and much greater collaboration across the Gulf. Battery powered ferries are starting to become a reality overseas, can that work in Auckland to further reduce emissions and what are the costs of doing this. In general, what will costs be in the future. If we’re adding a heap of new services and routes, how do they plan for downtown infrastructure to cope. A separate section talks about the private sector driving innovation. What innovation is actually being proposed other than more of the same? It appears they’re suggesting a commuter route to Takapuna via Shoal Bay, how would that even work? Ferries from Panmure and Point England to Half Moon Bay. Why would anyone do that, especially from Panmure when in the not too distant future the busway and bus lanes could make buses much faster and more reliable. Same goes for Te Atatu where current plans will see a fast trip to town possible on the light rail line that’s being planned. Overall I’m left with the impression this is case of Fullers pushing for greater public investment for their benefit. 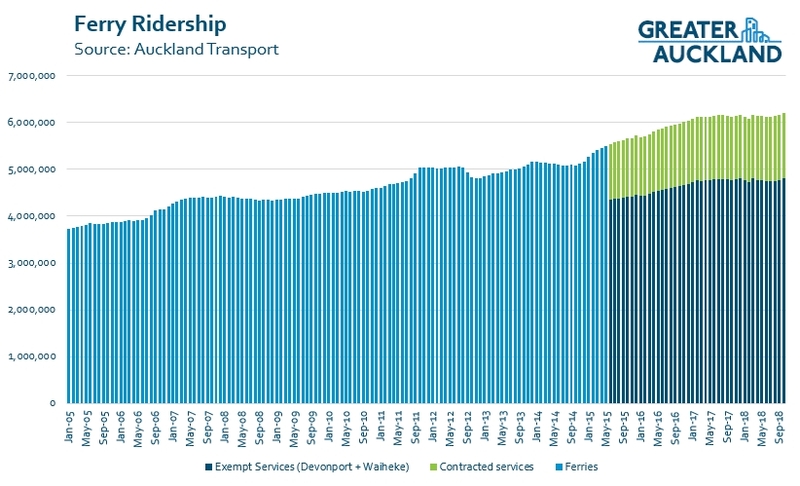 Perhaps a condition of more investment in ferries is that they give up their commercial commuter routes and let them be contracted by AT like every other PT service in Auckland. That could help allow better integration a part of a proper PT network. Re Te Atatu; sure, I agree that light rail is probably the best way to get to the city, but I’d really like to be able to go from Te Atatu to Hobsonville/Beach Haven, Northcote or Devonport by ferry. And especially to Takapuna via Little Shoal Bay. The ferry discussion comes up every few years in Te Atatu. For Te Atatu South the main restriction always seems to be the lack of space under the motorway to fit a reasonably sized ferry (to justify running the service). Not sure about the options from the peninsula. They can have a ferry built and runnig long before any ground is dug and a tram line installed. It will be a decade or more before a tram gets anywhere near Te Atatu. Trams will never get anywhere near Te Atatu… light rail on the other hand is a government priority. Assuming that government stays elected in 2 years time. The other lot would cancel it. If National want to win the next election they need a leadership spill immediately to start campaigning fresh faces. The current dumpster fire isn’t exactly a winning team. Could somebody please explain their understanding of the difference between trams and light rail? Isn’t “light rail” just a modern tram system? And is it not a dreadful mistake to think that a light rail / tram down Dominion Road could ever be a satisfactory way to get weary luggage-toting airline passengers to the CBD quickly? A modern tram system is a modern tram system. Like an old tram system, but new vehicles. Trams are short, low capacity, stop often, wait for traffic lights, and roll along getting stuck in queues of mixed traffic. Light rail is a metro train that mostly runs like a metro, but can also run at street level where it needs to. Light rail and modern trams are essentially the same thing, with light rail tending towards longer distances and more separation from roads, but it’s just a matter of degree. In the CBD the new lines will behave like trams, out in the suburbs they’ll behave like light rail. If British experience is anything to go by people will call them trams, whatever the official name..
I’d still make more distinction. In the CBD the light rail will run on a completely dedicated rail-only corridor, with no traffic lanes, no side streets, and only a few major cross streets where the LRT has signal priority. That’s much more light rail than tram. That’s more dedication to the light rail than the best of Melbourne’s CBD tram corridors, and far more than most of their tram corridors, for example. A matter of degree yes, but really talking about opposite ends of the scale. To wit, Melbourne has modern trams. The latest ones are still rolling off the production line, so as modern as the can be. But they are still relatively small vehicles that run in a single mixed traffic lane, get stuck behind cars, have no signal priority at intersections, have passengers step down into the street to board, average about 15km/h, a run every twenty minutes. Our light rail will be so much more than a tram route with a modern tram vehicle on it. If anything, we should just call them trains for shorthand. They have a lot more in common with our trains than with trams. Nick R, just because much (but not all) of Melbourne’s tram system is as you describe doesn’t mean that all tram networks are like that. For example, ride on trams in Croydon or Manchester and you’ll experience nearly exactly what is planned for Auckland – dedicated corridors, signal priority, minimal cross streets, high-speed railway-like (many in fact ex-railway) private rights of way – but they’re still trams. Your small slow trams stuck in queues of traffic are typical of mid-20th-century tramways (which is one reason why so many of them disappeared), not modern 21st-century ones. Call it light rail if you will, but Auckland’s network will be just like those modern tram routes with modern trams running on them. Light Rail is light rail, Trams are what you call light rail when you don’t like light rail. Perhaps some other names should be changed if people are going to play that game. Carparks could become “Highly Subsidised Personal Storage Spaces”, or “Welfare Spaces”? Vulnerable Users could become “People Systematically Ignored and Endangered Through Design for the Car” or “Those Paying the Price”? Cars could become “Expensive Passports For Access to the Funded Mode” or “Motorised Inequity Equipment”. Slip Lanes could become “How we Show we Hate Children” or “Flo’s Guillotine”. Think of it as the difference between the Northern Express and the average local bus line. Stop being pedantic, light rail or Trams (as that what the general public will call them) won’t be anywhere near Te Atatu anytime soon, a ferry on the other hand can be purchased or built far quicker. Trams in NZ, Aus and UK, Trollies in the US and Canada and Light Rail in Europe and elsewhere (to get away from the historical stigma of the other two names). All built to the same spec and role. Talking of ferries – now that they have decided to reopen Northcote Point but NOT in the 20 million all weather form, its interesting that Skypath might be their best bet to argue for a more substantial upgrade in a few years (tourist one way trips). It must be nice, I didn’t think as someone commented I think yesterday, that with SkyPath opening it would be less relevant for commuters anyway & would actually reduce traffic generally around there (parking for the ferry) making the cycling/walking link more pleasant. Easy to stay with the middle of the road status-quo I guess. It could of been made into a purpose built fishing wharf or something perhaps? Taking a ferry to work every morning would be such a nice way to commute… the more routes the better! It is. I’ve been a Bayswater Ferry commuter since 2000. It’s quite social too. You end up knowing lots of other regular commuters as well as the crews. Beats sitting in traffic any day! It must be great. I have heard of many people who commute via ferry speak positively about it. You can either relax and chill out and look out at the ocean to start off the day. Or you can catch up on some work on the boat. It is awesome. How far out did that wharf go!? It’s quite shallow in there at low tide. It was massive. Rebuilding it today to modern standards would be a huge challenge. Good photo, but for the hyperlink to work needs the .jpg added at the end. There’s nothing cheap about a battery powered ferry. What a bloody terrible map. They did the land in a sea colour and the sea in a twilight sky colour. It looks like a city that is the inverse of ours at night. I like the colours but I saw it inverted at first. I thought it was new train lines!.. only to be disappointed. Looks like another typical kiwi monopoly to me. It’s been great to see the growth in the Hobsonville ferry. In the 3 years I’ve commuted, the morning route has expanded from half-filling a small ferry to filling a much larger ferry. * more ferries, to improve frequency. Currently only 2 morning and 3 afternoon sailings to Hobsonville. * ferries set up for commuters, that are faster, quieter and allow speedy boarding and alighting. Imagine 2 trying to allight two double decker buses worth of passengers in single file. Fullers has done a great job of investing in larger vessels, but the smaller vessels are older and especially noisy. Tiri Kat subbed in on the Hobsonville sailing yesterday and you could hear conversations from the other side of the vessel; whereas on the usual Harbour Cat you have to shout to speak to the person next to you. So the context is that AT are working on a new ferry strategy. Various politicians and local bodies have been lobbying for the Waiheke and Devonport routes to be brought under AT’s control. If implemented, it will reduce fares by a massive amount (well over half) assuming that they are subsidised to the same degree as other public transport in Auckland, rather than running at a fat profit. Fullers has recently forced another competing ferry company on the Waiheke route out of business by running a surfeit of boats and timing them to run just before the other company (but reducing the number of sailings again after the other company quit) and timing the buses (that they also operate) to serve their boats but not the other company’s. In this context, this glossy report can only be seen as an attempt by Fullers to stave off having AT control the Waiheke and Devonport routes and maintain an effective monopoly. It’s typical corporate behaviour and a good reason why AT should be running ferry services and not Fullers. What is unclear is why ATEED should be spending taxpayers’ money on supporting Fullers in this endeavour? Waiheke residents must wonder whether the APTR (‘bed tax’) they are now paying on accomodation units to fund ATEED has been spent on this. How is ATEED going to ‘grow the visitor economy’ by keeping ferry fares high and increasing the cost of accommodation? Takapuna via Shoal Bay? Easy -an amphibious vehicle! That’s what they are planning isn’t it? I wouldn’t trust Fullers as far as I could throw the Kea.Price gouging monopolists. This is all just PR fluff. Yes they need to bring all routes back under AT control. Devonport should be the same price as bus but maybe with a small surcharge (say $1 more). Certain ferry services could do with feeder ferries – Whenuapai/Herald Island/Greenhithe/Paremoremo/Riverhead could all be served by smaller single crew boats connecting them to Hobsonville Point. I agree with all this. The other reason that the routes need to be back under AT control is so there is control over the noise pollution from the ferries. Getting the right boat for the right service and running it at the right speed to ensure the noise is minimised isn’t something a commercial operation has any incentive to do. Waiheke ferries have a slightly different issue – under capacity, so they can’t take everyone who wants to travel sometimes. There were queues round the block city-side at the weekend due, apparently, to Taylor Swift being in town. Maybe next time she should announce in advance that she’s coming? what noise they are pretty quiet. We’re not talking about a power boat with an outboard engine. OK, I’ll tell my ears that. :/ I think there are some routes that have boats either with loud engines or are being pushed at a speed to make them loud. I’ve moved to another bedroom on the other side of the house now, but I was being kept away by (apparently) the Greenhithe ferry. And no, my house isn’t on the coast. One major reason all ferry routes should be brought back under AT control is that then there is no commercial excuse to exclude ferries from the transfer fare structure (i.e. if you travel on a train and a bus to complete your journey you only pay for one fare if you have 30 minutes or less between the 2 segments). As a regular ferry commuter I find the current setup a rort. Example: if I take the bus from home to the ferry terminal, ferry to the city, then take the train to my destination I am charged for 3 separate journeys. When I have an Inner Harbour monthly pass loaded on my Hop card I’m still charged for separate bus and train journeys as the pass is a Fuller’s fare construct and not AT’s. The half moon bay area is tucked away from pakuranga road so the bus way may be too far and indirect. Time wise is competitive and more efficient because train from panmure to city is quite fast. Another benefit is the passengers can go to different train stations destinations. For example instead of going to britomart, they can go to newmarket. Finally if the ferry to Panmure does become popular, they can increase the frequency from half moon bay to Panmure by cutting the direct ferry to city. Due to its short distance, they can have very high turn up and go ferry service frequency. While you are right that Halfmoon Bay is separated from bus routes, the ferry terminal is actually out on a bit of a headland. Most people who catch the ferry travel there from somewhere else, they are likely closer to a bus route when they are at home than when they are at the ferry terminal. I doubt many people are going to make their way to the ferry to then back track to Panmure and catch a train, bearing in mind the Panmure ferry wharf won’t be right next to the train station. There is no way this would be quicker than the direct ferry from Halfmoon Bay to the CBD. Ferry from HMB to Panmure is unspeakably stupid, it’s 1.5km from bridge to railway station. By the time you’ve got the station the ferry will already be in the city. Also without “turn up and go” frequency to match the eastern line post CRL what’s the point ? This may surprise you but people work in places that aren’t the city. Explain how that make a HMB to Panmure ferry any more viable ? They actually trialled a hovecraft from Wellington to Petone a few years back but I believe the open nature of harbour and windy conditions made it a no go.. I actually ( not knowing anything about the technical aspects myself) wonder if that is not a bad option for Te Atatu and other spots that are very shallow – save the impact of having to dig massive channels? Almost nobody but military run hovercraft anymore, the fuel consumption is pretty horrendous. In addition to the Shoal Bay/ Takapuna weirdness, the lack of care in this map is shown by the proposed berthing north of Brown’s Bay which is called “Millwater etc”. This is (a) nowhere near Millwater, which is behind Orewa [perhaps they meant Stillwater? ], and (b) appears to be on Karepiro Bay next to the Weiti Bay private gated community. It’s also a marine reserve. Oh, and Millwater is misspelled “Milllwater” (3 Ls), Glen Innes is Glenn Innes, Whangaparaoa is Whangaparoa, and Tiritiri Matangi is a “Sland”. Takapuna to City. That’s bus to Bayswater Ferry Terminal (25 min); wait, board; Ferry to Downtown Terminal (10 min). Or bus to City – 20 min and a variety of city destinations, from choice of buses. A great idea. Perhaps they can divert some money from cycle lanes to ferries instead? Who Fullers, famous for their cyclelanes? At least read the article before coming out from under your bridge and trolling. I bet far more Aucklanders would use ferry’s than even think about commuting on a bike. That’s a bet you would lose. The numbers above show 6m ferry trips a year. Let’s say 75% of these are commuters, and because they generally would do two trips a day, that comes to around 6000 people commuting by ferry. The AT active modes survey found that approximately 100,000 Aucklanders commute by bike. So not even considering the people that might THINK about commuting by bike, it looks like currently around 17 times as many people commute by bike than by ferry. I’ve just read the full report. Very self-promotional and heavy on unsubstantiated claims, but I can’t see any evidence that a privately-operated Fullers ferry can achieve better results than an AT-contracted public transport ferry, costing less than half as much. Logically, if benefits come from ferry use, then the amount of benefits would be expected to increase if prices were reduced and more people then chose to use ferries over the alternatives. The website makes clear that they are trying to go over the top of the AT review of ferries: “Fullers360 is calling for collaboration among those interested in shaping the future of the Hauraki Gulf. We’re inviting relevant parties to join a working group…”. My inference is that they believe that AT is seriously considering bringing the exempt ferry services under the PTOM (https://www.greaterauckland.org.nz/2013/02/07/what-is-ptom/) and naturally want to disrupt that. The big question is why would ATEED want to assist them to do so? Oh dear. You’re probably scraping at the surface of a nasty wound there. Why would ATEED want to assist private enterprise in a way that provides a poorer outcome for residents of Auckland? It is a very good question. Hopefully they will improve the frequency of Hobsonville point ferry. Also why only fuller is the monopoly operator? Shall AT encourage other operators to break that monopoly? Would have been far more impressive if the report had set out their plans for fleet renewal. Features such as wide gangways and quick docking double enders for high frequency services. Electric or hydrogen propulsion. Moving Waiheke and Devonport services to the eastern side of Queen’s Wharf, where POA moor their rugs, to reduce congestion in the present ferry basin. Bit of a worry if ATEED money has gone into this. I was reading a magazine in my Dentists a year or so ago, I don’t know how the magazine was, and there was an article where it was proposed to dredge and develop Barrys Point Lagoon to provide a Takapuna ferry terminal at the end of Byron Ave or thereabouts. Don’t know if that study or proposal went anywhere, but haven’t heard any more of it. And on the Northcote Point wharf. I note that $1m has been allocated to repair it. The AT report making that decision says that there are approx 80 regular users of this wharf. With building zone restrictions there is unlikely to be any increase in population in the catchment area for this wharf, so its hard to see patronage increasing in the future. Skypath is an unknown, it has the potential to both increase and decrease Northcote Point ferry numbers. How about AT cut their losses on Northcote Point and investigate a passenger ferry service to Chelsea Bay. This is relatively close to Highbury and the associated infill housing, terrace housing, apartments, and the like that is happening in this area. It is also right adjacent to NZ Sugar and the newly opened Visitor Centre and Cafe. I am sure that some of the staff and visitors to the refinery would use such a ferry. Just throwing this out there with some of the other confetti that Fullers have also thrown into the air to see where it lands. In terms of catchment, Northcote Point is geographically challenged, isn’t it? Skinny peninsula. Unless it allowed serious intensification, it seems like a waste of a service to me, too. Te Atatu has a much better walkup catchment. The location they show could have cycle-up catchment via the NW cycleway, buses coming from Te Atatu Peninsula that can pick people up from the light rail or rapid bus station on the way. Similarly, there could be buses coming from Henderson. I note the modelling from the 2014 report uses comparison with travel by motorway, which no longer holds because of the basket case that is SH16. I wonder if they’ll revisit this idea? What are the drawbacks? Not enough space under SH16? Marine reserve protection? Te Atatu has practically zero walk up catchment anywhere you could bring a boat in. The only place you could get ferry reasonably close to shore is down by the motorway bridge… and even then the wharf would need to be a couple hundred metres long. Then to add insult to injury this is exactly where there is a 500m wide reserve strip that is being fought over in a court battle. You can see the deep water, or lack of it, and the reserve clearly in this https://goo.gl/maps/VE9Jfs5pLEw. Now if you were talking about building Hobsonville 2.0 on that reserve land, and adding another couple thousand homes withing 500m of the water (and maybe dredging a ferry channel a bit) that might be a different story. I guess with sea level rise it’d be a silly place for a new development. And you don’t want to duplicate the light rail route either. One day, perhaps, a ferry from Te Atatu to Birkenhead …? Northcote Point still seems like a waste of a service. I’d put more services into Hobsonville, and improve the small ferries as Tom Jackson suggests, before investing in Northcote Point. I took the ferry to Hobsonville yesterday. What a great ride, the harbour was like a millpond at 1030. Yes, on a Saturday! This weekend there were special ferry services for the opening of the Hobsonville walkway and normal fares applied. The 1030 from Auckland had a very good crowd on board with most using their HOP cards. We called at Beach Haven and I counted 30 more joining for the short ride to Hobsonville. Probably 100 total on the small ferry. Surely this is justification for weekend services. Hobsonville Point and farmers market is becoming a weekend destination and it is a great 30 minute ferry ride to a different part of the harbour. Shows what a little promotion of services can do. My view is they should have both. The Hobsonville ferry should run via Northcote Point and Birkenhead. That way the resources of the two lines could be shared for much better frequency across the day. There would be no change for Birkenhead and Northcote passengers, except the opportunity to go the other way to Beach Haven and Hobsonville. For folk from Beach Haven and Hobsonville, the trade off is an extra five minutes or so on the run time, in exchange for maybe twice and many departures a day. Shoal Bay is a mud flat at low tide, at high tide it’s still very shallow, I can’t see any ferry getting in there. Nice idea though. The best place for a ferry wharf is by the boat ramp. It’s a bit of a walk down to Chelsea Refinery from Highbury, and a real slog back up. I don’t see why ferry services couldn’t be extended all the way to Riverhead, they want the train but a ferry could do the same job and probably faster. We could have a hovercraft ferry over the mud, just like the Isle of Wight! Riverhead is just as bad as shoal bay. You’d be lucky to kayak up there at low tide. It does raise an interesting question, just what would it take to dredge a ferry channel through the mudflats, how much cost and environmental impact? Most of the marinas in Auckland have a dredged channel approach, and ironically half our ferries run out of marinas because they have the all-tide channel to them. We can do it for yachts but not ferries? Like what? Where would a ferry on the Manukau go to and from? South/West Auckland … e.g. a ferry from the airport to Onehunga wharf, and on to fast train to Britomart … commuter ferries from the outer reaches of the Manukau Harbour where there is so much in fill housing being developed … the Manukau Harbour has been neglected and overlooked for so much of Auckland’s history. Yes, the conditions are more rugged, but this could be managed and some ferry services around the Manukau Harbour would help to reduce overall traffic congestion around Auckland. Ferries on the Manukau Harbour for South/West Auckland … e.g. a ferry from the airport to Onehunga wharf, and on to fast train to Britomart … commuter ferries from the outer reaches of the Manukau Harbour where there is so much in fill housing being developed … the Manukau Harbour has been neglected and overlooked for so much of Auckland’s history. Yes, the conditions are more rugged, but this could be managed and some ferry services around the Manukau Harbour would help to reduce overall traffic congestion around Auckland.